NPR’s Carrie Johnson, ACLU’s Jameel Jaffer, and I discussed yesterday whether the Administration decided to blow off the House Judiciary Committee panel on targeted killing because appearing and answering questions might compromise their uncompromising stance in the targeted killing FOIA. I can’t imagine what kind of stupidity drove the decision to blow off the committee. In which he suggests both John Brennan’s nomination and ACLU’s FOIA may have driven that decision. I can imagine two reasons, though I agree with Marcy that it was stupid—and, I will also add, wrong—of the administration to stiff the committee. The first is John Brennan’s pending confirmation. The last thing administration wants right now, prior to a Senate vote on Brennan, is to create a forum in which officials get more questions on targeted killings. The second reason, as I said at the hearing, is FOIA litigation. Every disclosure prompts more demands for more disclosures and prompts arguments that material is not, in fact, secret. So there’s a hunker-down-and-say-nothing mentality that has kicked in. As I say, it’s wrong. And as the tone of yesterday’s hearing—where Republicans and Democrats alike were clamoring for judicial review of targeting decisions—shows, the administration has a lot of work to do with Congress if it means to maintain confidence in its policies—work that will have to be done, at least in part, in public. But it’s not hard, in my opinion, to imagine what’s behind it. The Senate intelligence committee on Wednesday postponed until next week a vote on the confirmation of White House aide John Brennan to be CIA director, dashing hopes of Democratic leaders who had hoped to have a vote on Thursday. No explanation for the delay was immediately available. However, the Obama administration has been at odds with members of the committee’s Democratic majority over White House unwillingness to disclose some highly classified legal documents related to “targeted killings,” including the use of lethal drone strikes against suspected militants. On Tuesday, the Administration shared the Benghazi emails with the Benghazi Truthers, which had been their plan to move Brennan’s nomination forward without turning over any more memos. And while some Republicans, just moments after they received the emails, made a mild stink about Brennan’s thoroughly predictable involvement in efforts to craft talking points about the attack, by Wednesday, that already proved insufficient to move the nomination. By Wednesday, the Administration was sharing more information on the memos, not Benghazi. And then, after sharing such information, we learn the Administration has been left to stew over the weekend. A senator who sits on the Intelligence Committee and has read some of the memos also said that the still-unreleased memos contain secret protocols with the governments of Yemen and Pakistan on how targeted killings should be conducted. Information about these pacts, however, were not in the OLC opinions the senator has been allowed to see. The senator, who also would speak to National Journal only on condition of anonymity, said the only memos that the committee has been given represent mainly legal analysis justifying the drone strikes, and that the rest contain “case-specific” facts about operations. In response to which an anonymous official who looks like Tommy Vietor made dickish comments about how unreasonable it would be to let the Senate Intelligence Committee exercise oversight and how mean it is to use confirmations to insist on being able to do so because it just feeds into Republican plots. An Obama administration official who is familiar with the negotiations with Feinstein’s committee indicated that the White House was miffed at efforts by the senator and her staff to obtain all the memos at once, because such efforts play into the Republican strategy of using the dispute to delay the confirmation of John Brennan, Obama’s nominee to head the CIA and the main architect of the drone program, as well as Chuck Hagel as Defense secretary. Perhaps senior administration officials leaking information presumably contained in the memos to the NYT didn’t help matters. With the Talking Point emails shared, Benghazi is frittering out, and the Republicans will need a new scandal to fundraise off of. And a potential fight over whether or not the President has to say whether he thinks he can kill Americans in America has the distinct advantage over both Fast and Furious (their most successful scandal to date) and Benghazi (which wasn’t nearly as successful) in that people across the political spectrum (save those who think Obama should be trusted with this authority because, well, he’s trustworthy) may think it’s reasonable. That is, while (some) Republicans may only be picking this up because it demonstrates the Administration’s double standard with respect to the Bush Administration, or because their prerogatives have been slighted, or because they figure this paranoid level of secrecy might be hiding real misconduct, the targeting killing memos are close to reaching a tipping point at which they turn into a real political issue. And that may be what the Administration will be stewing over this weekend. In the face of that threat, then, there’s just the FOIA. Mean old ACLU Legal Director Jameel Jaffer, FOIAing for more information on the President’s authority to kill Americans (and also, it should be said, helping the Awlaki and Khan families sue for wrongful death). How dare he do that, even if John Brennan, in one of the Administration’s key counterterrorism speeches, emphasized how important presumptive disclosure on FOIA was? The President also issued a Freedom of Information Act Directive mandating that agencies adopt a presumption of disclosure when processing requests for information. So what if John Brennan says the terrorists will win if the Administration plays stupid games with FOIA? There are lawsuits to be won, damnit! Now, I have no doubt that the Administration might delay Congressional oversight solely to gain an advantage over the ACLU. Not only did Daniel Klaidman’s sources reveal such suits were at the forefront of their considerations when deciding not to be as transparent as promised, but it appears the Administration already delayed Congressional oversight so as to gain an advantage in ACLU’s FOIA suit. So yes, it is likely that is one of the reasons DOJ chose to snub the Committee, thereby making this issue more of a political issue. But it seems the Administration has lost all perspective about how those FOIAs might play out. That’s true, as Jack Goldsmith pointed out, because even if a judge rules that the Administration has revealed what it has been trying to avoid revealing, it’s not the end of the FOIA world for them. Even if the D.C. Circuit concludes that the USG has in effect officially acknowledged CIA involvement in drone strikes, however, it need not follow that the CIA must cough up a list of all responsive documents. These lists alone – which typically contain document titles, dates, and the like – can disclose quite a lot about what the CIA is doing. Some of the information in a Vaughn index might reveal or point to sources and methods or other properly classified information that would harm national security. I see no reason why the D.C. Circuit could not rule that the USG has acknowledged CIA involvement, but then rule that (a) the CIA need not produce a Vaughn index if doing so would disclose properly classified information, or (b) the CIA must produce a Vaughn index but can redact any entries in the index (including all of them) that would, if revealed, disclose properly classified information. Option (a) was suggested by Judge Easterbrook in Bassiouni v. CIA, 392 F. 3d 244 (7th Cir. 2005) – an approach that, as Easterbrook noted, is entirely consistent with the FOIA statute. Option (b) is simply a more fine-grained substitute for the Easterbrook approach that would force the government to explain its redactions (and which need be no trickier than the already-tricky process of forcing the government to explain why the documents referenced in a Vaughn index need not be disclosed). Even if ACLU wins on the “official acknowledgment” issue, in short, it has a long way to go to get the records it seeks. But as we have seen more than once in the last decade, even heavily redacted Vaughn indexes can reveal important information and constitute the basis for further FOIA requests and further disclosures (through FOIA or other means). I’d add that, at least in the 2nd Circuit, the Administration seems to be protected by overly broad protection for the Memorandum of Notification that authorizes targeted killing and everything else. And unless there are really big disclosures in there that even I can’t imagine (plus, who besides me is going to look that closely? ), there’s simply nothing that will come out in FOIA that will be more damaging than inciting the Republicans to turn this — a real example of abuse of power — into their next political scandal. Trust me, Obama folks, you made the wrong calculation here, and you’d do well to reverse course before it’s too late. Though I will make one final caveat. I don’t think the FOIA could be all that damaging to the Administration. But I do think the wrongful death suit might. This discussion will make it very hard for the Administration to dismiss of this counterterrorism suit the same way they have every other one, by invoking state secrets (and while there might be standing issues, particularly for Nasser al-Awlaki, Sam Alito won’t be able to suggest the Awlakis and Khans can’t prove their family members were killed in a US drone strike). And having lost the veil of state secrets, there are all sorts of issues that might come out, both about Awlaki’s history, and about why the FBI let Samir Khan leave when every other known radical trying to head to Yemen gets arrested before he boards a plane. And, quite simply, if they can’t prevent Khan from pursuing this wrongful death suit, some interesting legal conclusions. 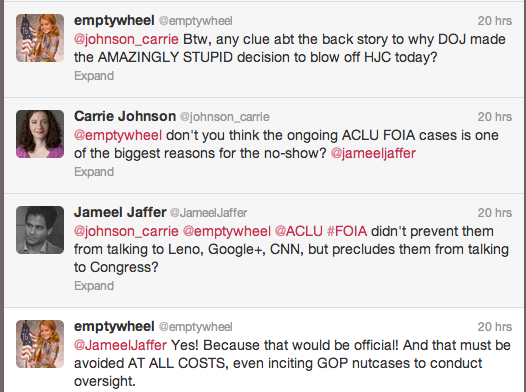 So while I think to the extent the Administration is still stalling Congress because of the FOIA, they’re crazy. If that’s the case, they’d be risking giving Republicans a really dangerous issue to politicize next. All that said, I think the wrongful death suit may present real issues for them, particularly as this information becomes more public. But if it does, then it just serves to prove that the case for killing Awlaki and Khan and Abdulrahman doesn’t withstand legal review. Is This a Benghazi Question? Particularly given some of the rumors about what the CIA was doing in Benghazi when Ambassador Chris Stevens got killed, I wonder whether this question — from the follow-up to John Brennan’s confirmation hearings — pertains to Benghazi. In your responses to the Committee’s pre-hearing questions, you wrote that Chiefs of Mission must be kept fully and currently informed of the activities of U.S. government agencies in their countries, consistent with the provisions of 22 USC 3927. That statute also requires that U.S. Ambassadors “shall have full responsibility for the direction, coordination, and supervision of all United States Government officers and employees in that country,” and that “any department or agency having officers or employees in a country shall… comply fully with all applicable directives of the Ambassador. Is it your understanding that intelligence activities are subject to the approval of the Chief of Mission? Yes. Pursuant to the President’s instruction, codified in a 1977 agreement between the Department of State and the CIA, the Chief of Mission has a responsibility to express a judgment on all CIA activities in his or her country of accreditation in light of U.S. objectives in the host country and in the surrounding areas and to provide assessments on those activities to Washington. Further, if the Chief of Mission believes a CIA activity might impair U.S. relations with the host country, the Chief of Mission may suspect a CIA or other intelligence activity. If disputes arise between the Chief of Mission and the Chief of Station that cannot be resolved locally, they are referred to Washington for adjudication by Principals. In order to enable the Chief of Mission to meet these responsibilities, the Chief of Station must keep the Chief of Mission fully and currently informed of CIA activities in the host country (unless the President or Secretary of State has directed otherwise). “Unless the President or Secretary of State has directed otherwise.” A rather big caveat. MInd you, this question could be as much about Pakistan as it is about Libya. After all, the Pakistan exception to the drone rulebook arose, in part, because of Cameron Munter’s past objections to the drone strikes in Pakistan. Nevertheless, as written, the drone rulebook appears to let the CIA — that is, John Brennan, once he is confirmed — to do whatever he wants with drones in Pakistan. None of those rules applies to the CIA drone campaign in Pakistan, which began under President George W. Bush. The agency is expected to give the U.S. ambassador to Pakistan advance notice on strikes. But in practice, officials said, the agency exercises near complete control over the names on its target list and decisions on strikes. Imposing the playbook standards on the CIA campaign in Pakistan would probably lead to a sharp reduction in the number of strikes at a time when Obama is preparing to announce a drawdown of U.S. forces from Afghanistan that could leave as few as 2,500 troops in place after 2014. Officials said concerns about the CIA exemption were allayed to some extent by Obama’s decision to nominate Brennan, the principal author of the playbook, to run the CIA. So it’s not clear what weight Brennan’s answer has given that it appears the President has already written an exception for Pakistan and drones. All that said, given the many reports that Chris Stevens didn’t know what the CIA (or, allegedly, Brennan, running ops out of the White House) was doing in Benghazi, I find DiFi’s effort to get Brennan on the record on this question rather interesting. https://www.emptywheel.net/wp-content/uploads/2016/07/Logo-Web.png 0 0 emptywheel https://www.emptywheel.net/wp-content/uploads/2016/07/Logo-Web.png emptywheel2013-02-15 15:12:222013-02-15 16:31:53Is This a Benghazi Question? Dianne Feinstein announced yesterday that the Senate Intelligence Committee would not, as originally planned, vote on John Brennan’s nomination today. No Valentine’s Day love for Brennan I guess. 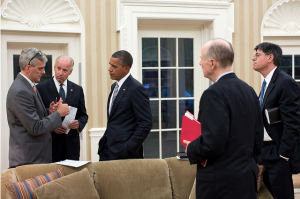 DiFi cited outstanding questions on Benghazi and the 7 OLC memos the White House has withheld. That’s important background to this Joshua Hersh story, which makes fun of Richard Burr (who had just made a joke about his relative Aaron Burr killing Alexander Hamilton) grilling Jack Lew about who briefed Obama on Benghazi the night of the attack. 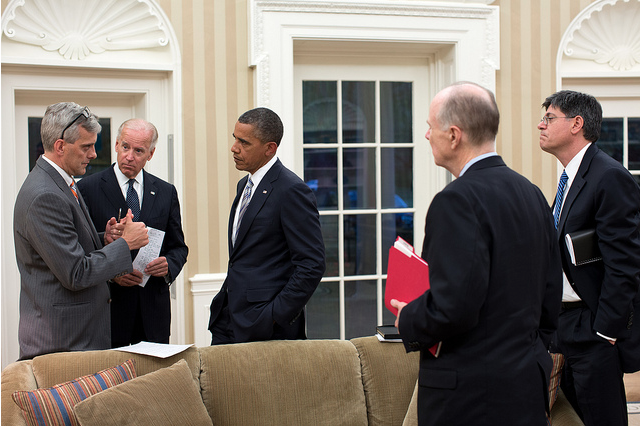 As Hersh points out, the White House has released a picture showing Denis McDonough briefing the President that day, which ought to answer Burr’s question. What Hersh doesn’t say is that Burr specifically asked Lew whether Brennan was in this loop. In the closed session on Tuesday, apparently, Brennan said he wasn’t. This comes on top of the White House withholding — at least as of last Thursday — Presidential Daily Briefs and some emails about the response to Benghazi as it unfolded. Now, Lew’s role in Benghazi briefings really won’t affect his job as Treasury Secretary. But Brennan’s role might, particularly if the Murdoch boosted eBook alleging he was running ops in Libya out of the White House is true (I’m not saying it is). In any case, the persistence of the Benghazi truthers has introduced an interesting dynamic I didn’t expect. Of the Republicans on the Senate Intelligence Committee, only Susan Collins and possibly Tom Coburn are not full-on Benghazi truthers (and James Inhofe, who gets a vote if he wants one as Armed Services Committee Ranking member, could add another truther vote). But Collins is part of the other group — along with at least Ron Wyden and Mark Udall — holding up Brennan’s nomination, those demanding the 7 OLC memos on targeted killing the White House has thus far refused to turn over to the Committee purportedly overseeing these killings. That puts the vote somewhere in the vicinity of 9 votes holding out for something from the White House, 6 votes ready to vote Brennan’s nomination forward. So who will the White House cede to? 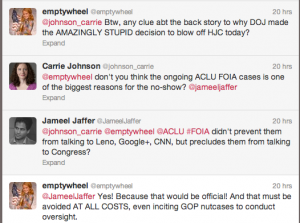 The Benghazi truthers, or the OLC holdouts? And is what is in the material the White House has thus far withheld enough for these groups to vote against Brennan? Note, there’s always the possibility these groups will converge. The public record supports the conclusion that Libyan militants in Derna claimed to have been struck or at least surveilled by a drone. Those militants have ties, at least, to the militants who carried out the attack on the Benghazi post, and the public record also supports the claim the militants were avenging that drone surveillance or strike. If that drone was approved by an unknown memo authorizing continued strikes in Libya, it would be something that both the Benghazi truthers and the OLC holdouts would be interested in. As I said earlier, the main gist of the Petraeus tapes–Roger Ailes’ attempt to get him to run for President–is neither shocking nor all that interesting (though it is amusing). But I can’t help but laugh at the irony of this detail. As Petraeus tries to explain to a rather thick Kathleen MacFarland why he thinks the CIA Director job would be “a quite significantly meaningful position,” he talks about the Libya intervention. He starts that discussion by predicting that CIA will run much of what we do in Libya (remember, this conversation took place on April 16, 2011, just after the US ostensibly turned the Libyan war over to NATO, but six months before Qaddafi was killed). He then tries to explain to MacFarland that the CIA is a national treasure (It takes Petraeus several times before he gets her to understand he’s talking about the CIA, not Libya or covert ops generally). Petraeus: Well, so we’ll see what happens. Look, he gets to pick the chairman he wants, and the guy he’s comfortable with. That’s the deal. And if they’re uncomfortable with a guy who they know will be heard, then okay, so be it. That’s his choice. Q: But you’re looking at something like the other one as potentially where you make the difference in Libya. Petraeus: I think you can make a huge difference. I think that’s a national asset — I think it’s a treasure. Petraeus: No, I’m talking about the organization. Q: Oh, you mean covert ops. Petraeus: I think that organization is full of just, heroes. Unsung heroes, which is the way they want to be. And again, so . . .
Q: And I agree with you. With the Arab Spring, you lose or you win it on covert . . .
Petraeus: If you look at . . . we’re not going to go out, do much more, I don’t think — I mean, I was surprised we did Libya. Q: Oh, that was insane. And so if we’re only going to overthrow countries via covert means rather than hot wars, it means DOD’s budgets will be cut. Petraeus: I mean, we’ve got . . . so if that’s the extent of what we’re going to do, we’re going to be retrenching militarily. Petraeus: Again, you’re going to take big budget cuts, and it’s going to be all about . . . it’s going to be the post-, sort of the early 1990s kind of stuff. And what’s the fun of being a top General during a time of budget cuts, after all? But if DOD’s budget is getting cut, it will mean CIA’s budget will grow (this time it takes Petreaus four tries to get this through to her; really, does Fox pay this woman? She’s an “analyst”??). Q: Yeah. It’ll be the “peace dividend” after Iraq, and after Afghanistan, it’ll be the peace dividend. Libya is a little bit of a screw-up on that. Petraeus: Yeah. Yeah. But on the other hand, the other folks — on the other hand — I think are going to be in a growth industry. Q: You mean Obamacare . . .
Q: Oh, the bad guys? Petraeus: Yeah, the intelligence community, I think, is going to be . . .
Q: The bad guys, or our — you mean our intelligence community? Petraeus: Our intelligence community. Going to have to be. I mean, there’s so much going on. Effectively, David Petraeus was explaining his MOAR DRONZ policy to MacFarland before he even accepted the CIA job. WSJ has a tick-tock of how the talking points on Benghazi developed. It confirms two of the things I noted yesterday. The Intelligence Community developed the talking points behind the pseudo-scandal pursuant to a request from Dutch Ruppersberger. Later on Sept. 13, then-director David Petraeus presented the CIA’s initial findings to the Senate Intelligence Committee. His conclusions mirrored that morning’s intelligence reporting. He said the attack began “spontaneously” following the protest in Cairo over the video. He also discussed the reports of involvement of Ansar al-Sharia and the al Qaeda affiliate and called the assault a terrorist attack. Mr. Petraeus presented the same findings the next day to the House intelligence panel, whose top Democrat, Maryland Rep. C.A. “Dutch” Ruppersberger, requested unclassified talking points for lawmakers to use when speaking about the attack. And the IC decide to withhold the information about a tie to AQIM in part because they were NSA intercepts. After rounds of bureaucratic exchanges, the CIA officials seeking to remove al Qaeda won the argument, and officials agreed to retain the umbrella term “extremists” but drop the mention of al Qaeda. The term represented a hedge the CIA used because the attack’s links to al Qaeda had yet to be confirmed. This argument was that including the name would have required additional wording to indicate uncertainty about the al Qaeda links—language that could have opened additional avenues for misinterpretation. The information was derived from what was seen as a “tenuous” source—intercepts of phone calls between suspected militants saying that al Qaeda-linked militants took part in the attack. The evidence was deemed by some of the intelligence officials to be inconclusive. The entire Benghazi pseudo-scandal can reportedly be traced back to House Intelligence Committee Ranking Member Dutch Ruppersberger’s request for talking points he could use to respond to journalists. Three days after the lethal attack on the American Mission in Benghazi, Libya, Representative C. A. Dutch Ruppersberger of Maryland, the top Democrat on the House Intelligence Committee, asked intelligence agencies to write up some unclassified talking points on the episode. Reporters were besieging him and other legislators for comment, and he did not want to misstate facts or disclose classified information. More than 10 weeks later, the four pallid sentences that intelligence analysts cautiously delivered are the unlikely center of a quintessential Washington drama, in which a genuine tragedy has been fed into the meat grinder of election-year politics. Before I get too far, remember that Ruppersberger (D-NSA) is one of the geniuses who believe the way to stem leaks is to prevent intelligence professionals from giving background briefings. Remember, too, that the talking points that have caused so much trouble were almost certainly tweaked to protect the intercepts Ruppersberger’s constituent, the NSA, had collected. Nevertheless, this guy, who presumably supports the principle of not telling militants we’ve got their phone tapped, and who thinks people with a more developed understanding of sensitivities around intelligence should not be able to brief the press directly, had to have his talking points so he could talk to the press himself. Ruppersberger’s inconsistency on this point reminded me that after the super secret drone killing of some American citizens last year, the Gang of Four all weighed in to assure Americans that Anwar al-Awlaki’s death was “legitimate” because there had been “a process.” The Gang’s loquacity contrasted sharply with the Administration’s silence on the very same issue, one reiterated since in the Administration’s Glomar claims about topics the Gang of Four feels welcome to discuss. That contrast is all the more troubling given that Ruppersberger admitted that the Gang of Four does not know who is on the Kill List (and therefore didn’t really know whether the killing of Samir Khan was “legitimate”). It’s all very neat. Not only does the Gang of Four enjoy immunity from prosecution under the Speech or Debate Clause. But they were–and presumably are–serving as journalistic sources on topics about which they aren’t (though legally should be) fully informed. Last week Julian Sanchez and Mike Masnick rehashed an earlier version of this, when the Bush Administration armed the Intelligence Committees with talking points that would reinforce their lies that the Terrorist Surveillance Program constituted the entirety of the illegal wiretap program. But the solution clearly is not the one the national security establishment increasingly appears to be adopting: to turn the four men and women who purportedly exercise the only oversight of the most sensitive programs into talking heads. That process almost certainly ensures incomplete briefing of these “overseers.” Worse, still, it guarantees a kind of complicity that makes the overseers-turned-talking-heads useless for oversight. WIth their push to limit background briefings, the Gang of Four have raised their own stock as journalistic sources. But they’ve also further gutted the inadequate oversight we’ve got over intelligence. We’ve known for some time that the military was rolling out its new-and-improved HUMINT function, the Defense Clandestine Service. But this article–laying out the ambitious goals of the program–is all the more interesting given several events that transpired since the NCS announcement: specifically, the Benghazi attack and the Petraeus resignation. Part of the logic behind the move, the article explains, is that CIA is already overstretched; this will allow CIA to task DIA resources with the collection driven by military, rather than policy, needs. The project was triggered by a classified study by the director of national intelligence last year that concluded that key Pentagon intelligence priorities were falling into gaps created by the DIA’s heavy focus on battlefield issues and CIA’s extensive workload. Over and over, the article suggests the CIA is so busy in part because of its involvement in the drone program. Through its drone program, the CIA now accounts for a majority of lethal U.S. operations outside the Afghan war zone. The CIA is increasingly overstretched. Obama administration officials have said they expect the agency’s drone campaign against al-Qaeda to continue for at least a decade more, even as the agency faces pressure to stay abreast of issues including turmoil across the Middle East. Meanwhile, the CIA hasn’t met ambitious goals set by former president George W. Bush to expand its own clandestine service. If the drone program has sucked up CIA’s time, the agency doesn’t appear to be complaining about it. On the contrary, the recently-departed David Petraeus demanded more drones, not more resources for HUMINT. The suggestion, then, is that CIA is too busy to collect HUMINT because it is so busy being a paramilitary organization. But look at the topics DIA is said to be focusing on.